I currently run a large aquaponics system. I have a very large commercial system with a total of nearly 2million litres of water. What would be the best way for me to do this? The pond is only 1m deep however I could have a deeper section just for the airlift pump? Would your design work for this if I dig a seperate section which is 160cm deep and have a higher LPM airpump? Your video says you can get 20,000 lph with 12w. It would be perfect if I can get 2,000,000 lph for 1200w? What you're suggesting should be possible, but keep in mind that the result in the video is in optimal conditions. As you add long lengths of pipe, bends, obstructions, and so on, this yield will go down. Your goal is to get the water to the Airlift and back into the pond with the least amount of piping, bends and obstructions to optimise the result. Technically, what you say in your second reply is correct, but it depends on how everything is connected. I haven't yet heard of using Airlifts on such a massive scale in this way but I have thought about it before. 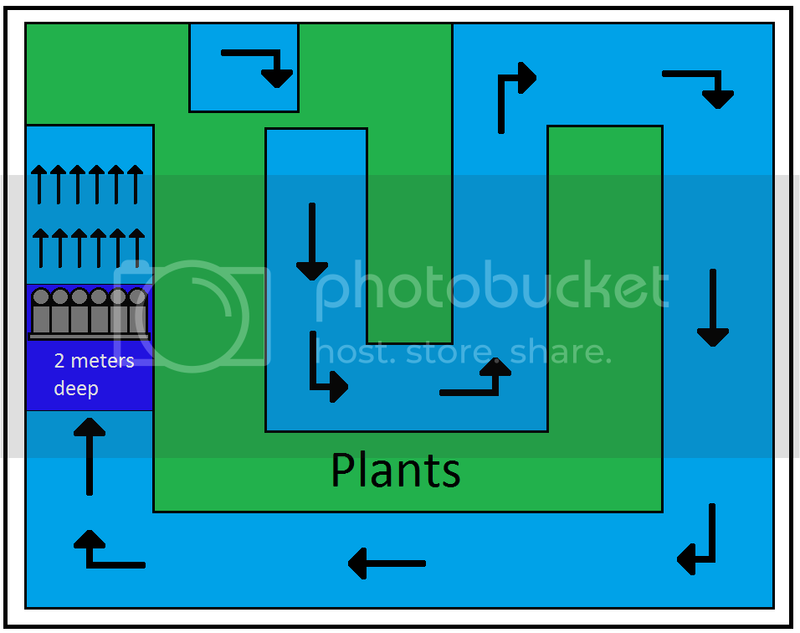 Could you explain in detail how you want to circulate the water? A drawing would be best. Then we can go from there. Its not actually built yet it's an idea I have for a large system but I'd need to create a water circulation current to help fish thrive. There would be no long length of pipe. I'd basically have one section of the system 2m deep with the airlift pushing the water in the direction I want the current? Could you be a bit more specific? I don't really know how to interpret your drawing exactly. A massive river like system some sections have plants on them. Ah I understand now, this drawing is fine. After I posted my image I already realised that would not work the way I had drawn it. You would indeed need to place plants in the stream or use floating/water plants. I am not all that familiar with aquaponics, my knowledge mostly applies to pond keeping. This makes me wonder how you will filter out the ammonia that will be produced. In a normal pond you would use media like lava rock, substrate, K1 media or Japanese matting which would become colonised with nitrifying bacteria. Plants will only take care of the end product, which is nitrate. Are you perhaps using substrate to plant the floating plants in? Because that could work if you use enough of it. Maybe the root systems of the plants will offer enough surface area for the bacteria to colonise, it might work in a setup this large. Besides this, your plan looks solid. And it should work. Since you have the Airlifts directly in the body of water, drag becomes irrelevant (as long as the entire 'stream' would be connected as seen in the picture without bottlenecks). However, keep in mind that this plan will require a sizeable investment. You say you want a flow of 2000000 litres per hour. This would require 1200 watts, which means you need 100 Airlifts. Assuming you would instead use Secoh JDK-20 pumps. This will be an investment of 100 x 135 euro (cheapest I could find). That's 13500 euro for the pumps. Although at these high volumes, I guess you would pay less. Then you would need the 100 Airlifts. You could build these all yourself, or buy them. If you are serious about this idea then we could also build them for you. But you have to consider that either way, that will be another 100 x 25/30 euro so 2500-3000 euro in parts alone. Have you considered all of this? Yeah I've considered all this. The reason I like the idea is because other than the electricity for the pumps it won't cost me anything else to run this. In regards to needing 100 air lifts is it not possible to just use larger air pumps? I know there's a haeilia air pump that gets 275lpm? Sean9461 wrote: Yeah I've considered all this. The reason I like the idea is because other than the electricity for the pumps it won't cost me anything else to run this. That is good to read. And you are correct. While it is a big investment, this is a large scale project. I believe that this would be the most efficient way to do it. Sadly it's not that simple. Our tests have shown that while efficiency with bigger pumps varies when using different Airlift diameters and lengths, efficiency always suffers compared to the standard Airlift with the 20w pump setup. The bigger Airlifts are mostly used by hobbyists who prefer a single bigger Airlift over multiple smaller ones due to personal reasons such as saving space or trying to maximise flow rate, regardless of power usage. These pumps can be used, but as far as I know the only result will be that less Airlifts are required, which will still be less efficient overall. Ok I checked efficiency of the pumps and I understand now why I need smaller air pumps. The stream would be a max of 4m wide... two ends would only be connected via the air lift. How would I get 100 pipes from one part of the pond to the other? I don't see there being enough room? For the first two options you have the 0.6 w per m3.. So you have the depth of the airlift then wrong way around? I see you've put the 20,000 lph on the 145cm depth and 15,000 on the 170cm? Also do you find circulating the water without lifting it aerates the water very well for high quantities of fish? These numbers are correct. They were posted on the Belgian site and checked and rechecked by every member who read that topic. The videos show this as well. The first two options are the most efficient, and share the same efficiency. When using the 20w pump on a 110mm Airlift, at a depth of 170cm the power usage will drop to 9w and the yield will be 15000 litres. 9/15 = 0,6 which means it takes 0,6 watts for every 1000 litres of yield. When using the same configuration, but with a 145cm long 110mm Airlift, these numbers change to a power usage of 12w (at less depth the power consumption will go up), but now the yield also rises to 20000 litres per hour. 12/20 = 0,6 as well. The efficiency is the same. This only seems to work this well with the 20w pump. As far as I know the bigger pumps all work best at a depth of around 170cm. Due to a number of circumstances, every Airlift and pump setup has it's own 'sweet spot' which can be optimised by changing the diameter, length and design of the Airlift and the type of pump used. The chart in the topic shows the best results that were achieved at that time. We intend to test more combinations in the nearby future. Sean9461 wrote: Ok I checked efficiency of the pumps and I understand now why I need smaller air pumps. I will get back to you on this topic, I think it would require some optimising to make it work. I am relying on Airlifts for my new project where I will keep sturgeon. Sturgeon are highly oxygen dependent. Every Airlift is essentially a 170 or 145cm high column of oxygen. Similar to having an air disk running at the bottom of a 170 or 145cm deep pond. That is a pretty high column where water is being aerated, with the added benefit that the Airlift will not clog and decrease it's output easily, if it all. Currently I am keeping seven sturgeon, most of these over 100/120cm long, in a pond with only one 30 or 40w air pump running two air stones at only around 70cm deep. This is already sufficient. I don't expect you would have problems in that regard.